One of the most common mechanisms used in zoom and focusing systems is to move all the lens elements in an assembly relative to the focal plane. In the image below changing the distance "A" from focal plane to first lens element is accomplished by turning a focusing ring. All lenses elements are mounted into a barrel lenses and are held in place relative to each other with a threaded retaining ring. This keeps the elements elements in the assembly distance, centration and tilt constant. 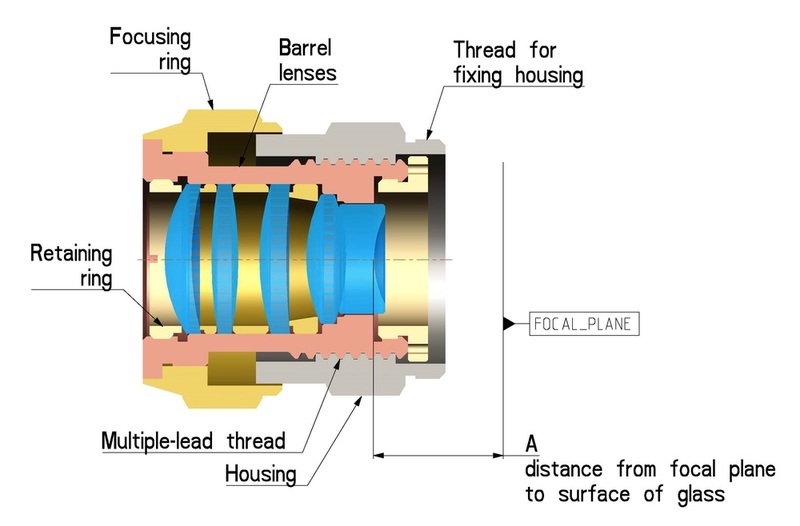 In the example below we use a multiple-lead thread ( 4-8 individual coarse threads working in parallel) When the focusing ring is turned, the threads act together to move the lens sub-assembly axially. The yellow retaining ring is screwed into the lens barrel. It prevents unscrewing of the lens barrel during focusing. If the lenses also rotate about the axis, the image will shift laterally while focusing. This can happen as a result of errors of manufacturing of lenses and mechanic parts or poor design. To avoid this problem the construction is made so that with rotation of a focusing ring the cell with lenses is moved only linearly. Please see our next blog posts for a description of other common zoom/focusing mechanism.